Well 2018 has come and gone and we are now into the second week of 2019. The New year brings promise with a mild winter so far and lots of rain. 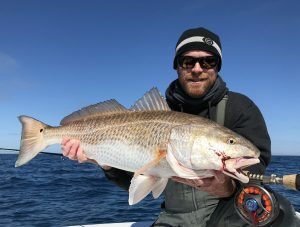 This new year fishing report isn’t really about what has been as much as with is to come. As we watch these short winter days come and go we sit around a warm camp fire on my back porch talking. The topics range from hunting season recaps to current and past days on the water. 2018 brought many memories and some amazing days on the water. 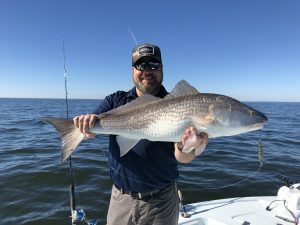 The Coastal Georgia fishery and ecosystem has seen some record rain fall that started back in early summer and has since continued into winter. 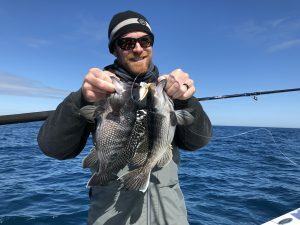 The early season inshore and nearshore bite was good and there were good number of fish to be caught. Trout stocks seem to be rebounding and the increase in size limits by the D.N.R. from 13 to 14 inches has been a great thing in my opinion. 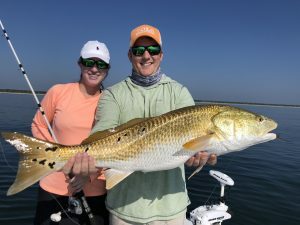 Redfish stocks however are still suffering with a very liberal limit still in place of 14-23 inches and 5 fish per person. We can only hope that the state of Georgia at some point follows South Carolina, North Carolina, and of course Florida and reduces the bag limits like all these other states have done over the years. Capt. Gary and I have witnessed the blatant disregard of the law by a few bad apples in recent weeks and unfortunatly the few “bad apples” are becoming all to common in regards to killing over the limit. 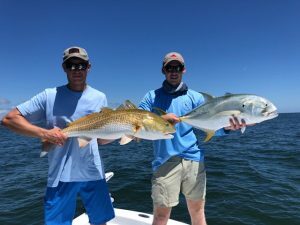 Just this last week we both witnessed a couple guys keeping over their limit on redfish. Gary spoke up one day and the guy call a buddy to come meet him so he could run in and unload to come back pout while his buddy held the spot and fill his cooler in the mean time. It makes us all sick!! 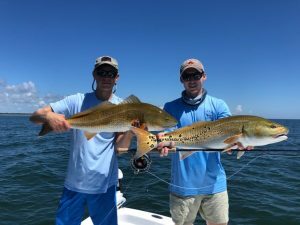 redfish aren’t the smartest of fish when it comes to deeper creeks and and how they feed. Lets be real here. If you find them or know where they live they will bite until the tide turns and sometimes they continue to feed after that. 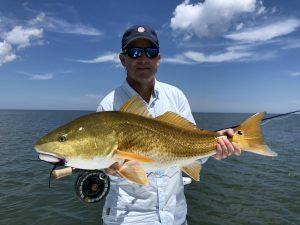 Redfish just don’t move much from their winter holes. 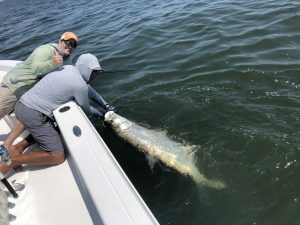 While tagging redfish for the state we have learned that the same fish will actually immediately bite again after being released. How do we know this? Easy we caught them again right after we released them with a tag in their backs. 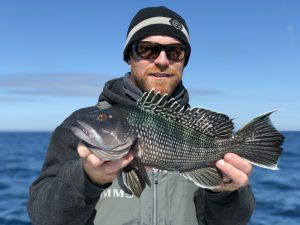 Its amazing how many fish we catch over and over. I have a fish that we have caught 7 times now. He has a tag and with that tag he has 13 of the most beautiful spots. He either isn’t the smartest or just hungry and since fish have to eat just like we do I’m going with the second one. It’s something to think about. If you enjoy catching redfish as much as I do look back through old photos. I bet you will find a picture or 2 of you holding the same fish on different days. A couple weeks ago Capt. Rob and I had a group trip and ran out to some of our local artificial wrecks. 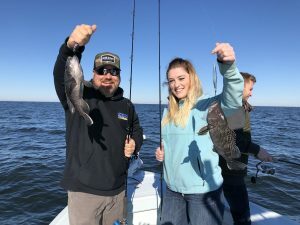 This time of year they hold big number of Black Sea Bass, Weakfish (grey trout), Blue fish, Bull Reds, and some huge sand tiger sharks. 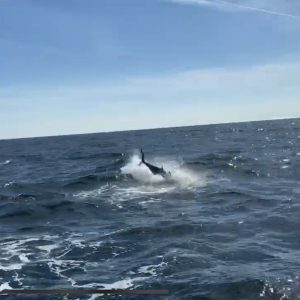 While in the bite my clients noticed some dolphins and wanted a few photos and videos. I called rob on the VHF and told him I was going to idle out and see the dolphins and we would call it a day after that. As I headed out I saw some pretty big blowups on the surface and pointed them. As we watched the dolphins. 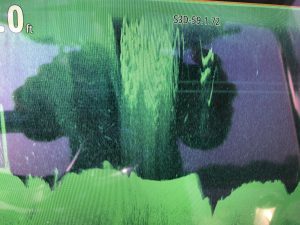 I noticed some very large boils on the surface not far off the side of the boat. 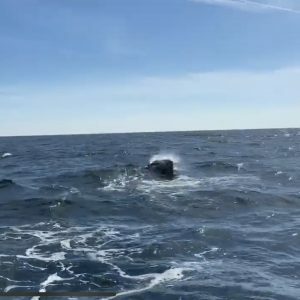 Out of the corner of my eye I saw a huge splash and realized I wasn’t looking at just dolphins. 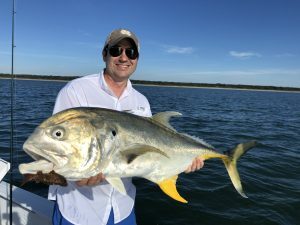 I grabbed the VHF and told rob I thought I was seeing some huge Blue Fin Tuna and he replied “water temp is right and there is a bunch of bait so I wouldn’t be surprised” At that moment I saw the marks on my Simrad bottom machine and new I was seeing Blue Fin Tuna for the first time in Georgia and I only had tackle for Sea Bass and Bull Reds. My stomach felt sick and I will never leave the dock without a big reel just incase again. 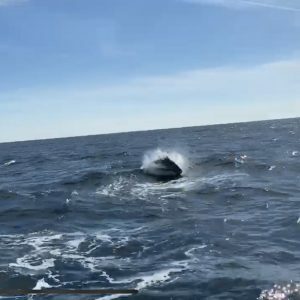 Tuna shots courtesy of Captain Bradley Maroney who also saw them that day and was able to get it on video. As spring nears don’t forget to call ahead and book your fun family or kids outings everyone loves during spring break. These trips and days fill up fast so don’t wait until you get to town to try and book! These trips are fun for the whole family. We offer 2 and 3 hour trips that can be arranged around your schedule and leave from either St. Simons or Jekyll Island. You can click Here to email us about availability. As I said earlier we are excited about 2019. Our new Dorado boats offer shade for clients and a much larger fishing area while still providing great comfort and ride. 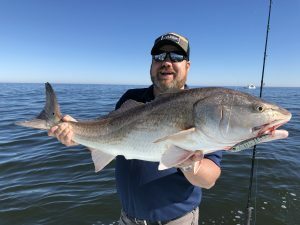 You can expect to catch trout, redfish, black drum, and flounder in the spring months inshore and Black Sea Bass, Weakfish, Bluefish, Bull Reds, and more on our near shore wrecks and reefs. I know some of you think summer is a long way away but its not and days are actually filling up for me fast. 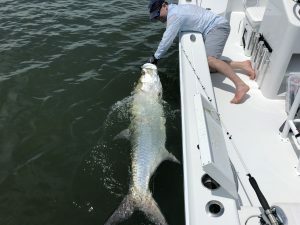 The 2018 Tarpon fishing season was pretty epic and me and my clients broke some personal bests like Champs 170+lb tarpon on fly and many days we caught what I have name the “Coastal Georgia Big Game Slam” where clients were sight fishing 20+ pound Jacks, 20+ Pound red drum, and Tarpon over 100 pounds all in the same day! These were exceptional days and I can only hope 2019 brings many more like it. 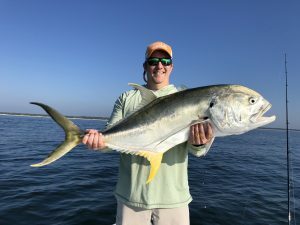 I think a 200 pound tarpon an fly in Georgia is just around the corner.